There came a time in my days at Recruit Training that I realized I wasn’t getting the comprehensive survival training I had expected when I joined the Marines. For some reason, I assumed that Marines, of all people, would be the most adept wilderness-survival experts in the world. However, perhaps the fact that boot camp itself is the least memorable event in the Marine Corps once you’ve been in the fleet for a bit, causing to become a large blur, maybe I simply forgot it all. I doubt it, because I don’t think there was ever a time in my 4 years that I was expected to start a fire without matches or truly survive in the wilderness on my own without MRE’s and supplies. The fact is, the average infantry Marine, at least during a time of war, isn’t really given much true survival training. In all reality, it isn’t our job. Our job is to shoot things, and shoot them well. I consider myself quite adept at that; however, I am slightly disappointed I didn’t walk out of the Marines ready to eat snakes and tree bark on a moment’s whim. That isn’t to say I don’t know how to camp–quite the contrary–infantry Marines camp all the time, usually every week. On my first workup, I’m pretty sure we spent more time in the field then we did anywhere else. That’s not the point, the field to us is ranges, room-clearing, maybe some land nav–but no true survival training. In retrospect, there was that 1 hour long brief when we got to CAX about how to survive in the desert, but hardly what I would call comprehensive training. Is it a necessity right now with our mission in Afghanistan? Obviously not, but it would be really awesome. For those of you that don’t know who Les Stroud is, he was the host of the now-cancelled Discovery Channel show Survivorman. 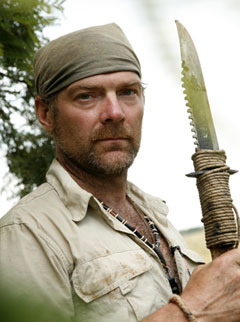 I recently discovered Survivorman on Netflix Watch Instantly and caught myself up to speed on all 3 seasons. He’s also Canadian. He’s also, frankly, a straight badass.